India inaugurated a multi-billion-dollar airport terminal in New Delhi on Saturday -- a shiny glass-and-steel symbol of the country's aspirations as an emerging global power. The state-of-the-art hub, which cost nearly three billion dollars and can handle 34 million passengers a year, was showcased at a special ceremony by Prime Minister Manmohan Singh ahead of its mid-July public opening. The airport, which will handle international and domestic travellers, was built in a record 37 months, with similar projects abroad taking more than 60 months, officials said. "This airport terminal establishes new global benchmarks," Singh said. "It also highlights our country's resolve to bridge the infrastructure deficiencies in our country." 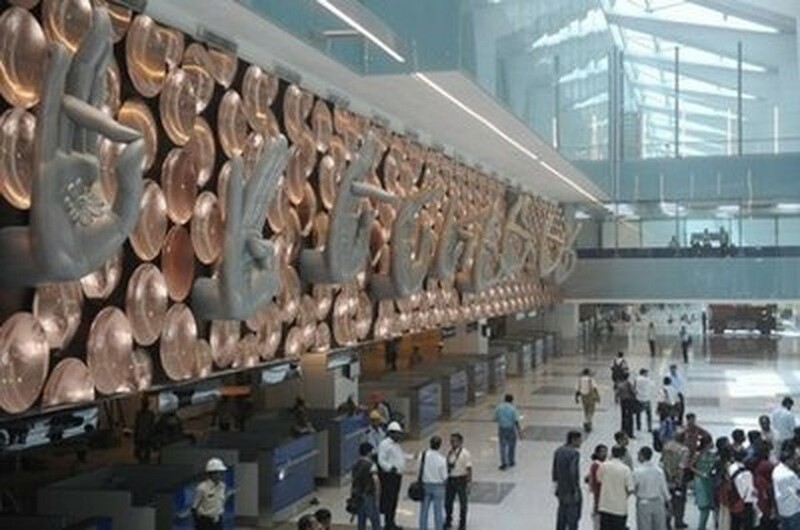 India inaugurated a multi-billion-dollar airport terminal in New Delhi on Saturday -- a shiny glass and steel symbol of the country's aspirations as an emerging global power. The premier said the project was an "outstanding example" of public-private partnership -- seen as the most viable financial model for India to execute big infrastructure projects as it eases the burden on government finances. Built in time for New Delhi's hosting of the Commonwealth Games in October, the terminal sprawls over four square kilometres (1.5 square miles) and boasts more than 90 automated walkways and 78 aerobridges. "This is a demonstration of what India is truly capable," Civil Aviation Minister Praful Patel said at the inauguration ceremony at Indira Gandhi International Airport, which was also attended by ruling Congress party president Sonia Gandhi. The facility, built by a workforce of 40,000, is India's third world-class airport after Hyderabad and Bangalore but dwarfs both. It is the largest public building constructed in India since the country's independence from Britain in 1947, according to the consortium that built it. "It's an advertisement of India's ability to create world-class infrastructure," economist D.H. Pai Panandiker, who heads the RPG Goenka Foundation in New Delhi, an economic thinktank, told AFP. As Asia's third-largest economy after China and Japan, India urgently needs to upgrade its dilapidated transport infrastructure, including ports and roads, which is seen as a major hurdle to accelerating economic expansion. "Overcoming our infrastructure handicaps will remove some of the major handicaps to faster growth," said Panandiker. Construction of the terminal comes as India's congested airport facilities are under increasing strain as travel demand surges in the world's second most populous nation of 1.2 billion people. The new terminal is part of government efforts to upgrade airports around the country, the ninth largest aviation market in the world. The government expects an annual 10 percent increase in domestic air passengers to 180 million by 2020 while international traffic could top 50 million in another decade. Mumbai, India's financial capital, is set to get a new terminal by 2012. India's fast-growing aviation sector could draw up to 120 billion dollars in investment by the year 2020, the government says. The new terminal was built by a consortium headed by south India-based GMR Group that included the Airports Authority of India, Germany's Fraport and Malaysian Airports Holdings. "This terminal shows the world that 'Yes, we can'," said GMR chairman G.M. Rao.